We’ll update this post as more details become available.. 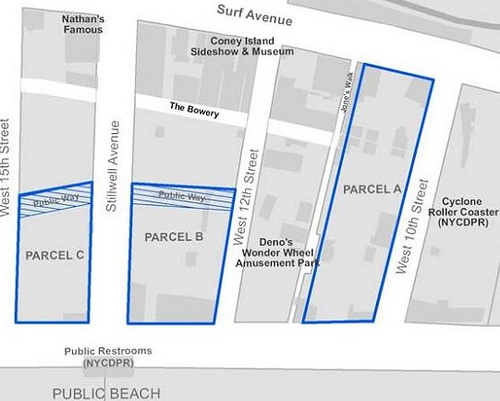 The location mentioned in the booking agent’s press release, which is Thor-owned land currently occupied by the BK Festival, is incorrect. The circus is actually coming to City-owned Parcel C, the empty lot across from the Scream Zone (Parcel B). It is also not a multi-year deal, as claimed in the release. ATZ has confirmed with Valerio Ferrari, CEO of Zamperla’s Central Amusement International, the operators of Luna Park and Scream Zone, that they are bringing in the circus for a one-year deal. Also, Ferrari says the deal is not signed yet. Shows are Tuesday through Fri, 6 & 8pm; Saturday, 4, 6 & 8pm; and Sun, 3 & 6pm. Tickets are available one hour before showtime and cost $10. At the show we attended, children 5 and under were admitted free of charge.